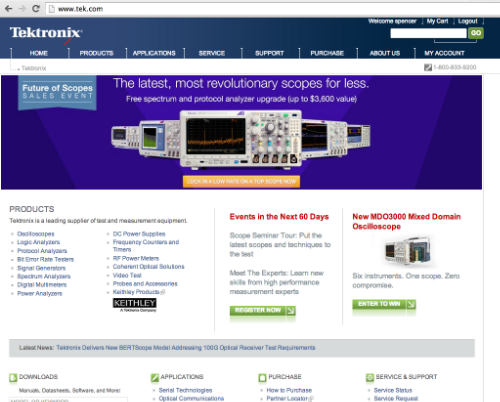 As a B2B ecommerce research mini-project, I spent a few minutes on the Tektronix website yesterday to evaluate their customer service and ecommerce integration. Both are excellent; here's a quick rundown. For a company with a diverse, highly customizable product line - and an annual revenue (as of 2006, when they were acquired by Danaher) of $1B - Tek's willingness to let me get on the phone with someone ASAP is really commendable. They've got an 800 number right at the top of every page, and their (pretty decent) automated phone system picks up in one ring. The *first* option on their phone tree is to speak with a representative, and I was connected to an actual person just 3 rings later - a totally reasonable wait time. Like a lot of B2B sites, Tek does *not* provide live pricing on some of their product line. But for a wide range of product categories, they display the base list price, and a link to configure the product, right on the product page. This may not seem significant, but a shocking number of B2B sites still don't do this. Kudos to Tek for taking the lead. They have an "Industry Comparisons" page that talks directly about how their products stack up against the competition. As someone who is inevitably shopping around, this is *really* nice. Tek's "configure and quote" page is pretty good. It shows the base price right at the top, and allows me to add items listed below via checkboxes. Unfortunately, the total price is *not* displayed in real time, but I give them a pass on that. My only real criticism is that the options aren't hyperlinked to give more context, info, or supporting documents for those items. The design here is a bit uninspired, but that's okay. I can add comments to my quote request and confirm the quantity and details of the parts that I want a quote for. There's also (still) a prominently featured 800 number in case I need more help. I'm a little concerned that I'm not going to get a quote quickly when I hit that "submit" button, but the overall layout and experience gives me enough confidence to go ahead anyway. 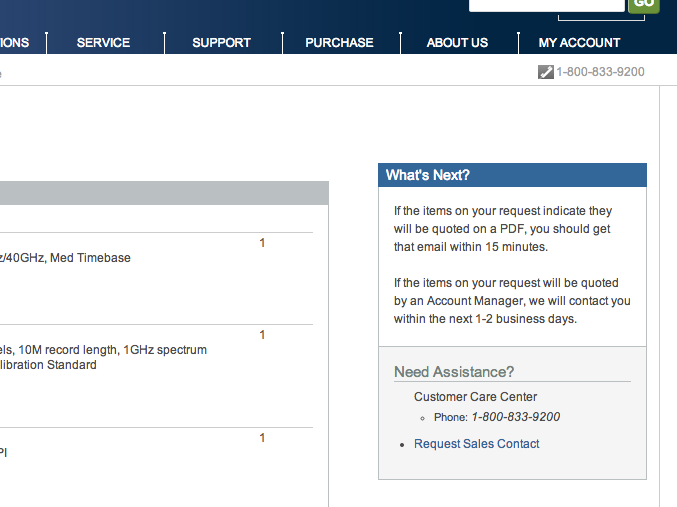 Order request confirmation page detail. This is *really* encouraging. The confirmation page is almost exactly the same as the request page, except that Tek is now telling me that I'll be getting a quote by email within 15 minutes. I am a very happy person at this point. Tek emailed me three minutes after I hit "submit quote." The email itself reiterates all the products I requested a quote for, which is really useful for searching my inbox later. Inside, there's a PDF of my quote, with a grand total just under $40k. I've got three quibbles here: First, I prefer to have a human being attached to my quote (all it says is buy@tek.com). Second, the payment terms field is blank - at the least, they should tell me to call them to talk about the options. Third, it's unclear what the shipping cost and terms are. They do show lead times on all the parts, but I'd love to know whether they're going to add on S&H at the end.